DIVINITY is made up of 5 musicians with 4 of them being original members of nearly 20 years of playing together. They’ve been described as Progressive Death Metal and compared to bands such as Soilwork, Strapping Young Lad, Death, and Fear Factory. Divinity, based in Calgary, Alberta, Canada, started in 1997 and began playing live shows in 1999. In 2001, the band released its first EP album called “Intensify” which recieved a lot of local (Canadian) praise after sending in a couple songs to BWBK’s Knuckletrack CD sampler. A music video was released for the song “World of Pain” in 2003 and the band played local shows building it’s show experience. Fast forward to 2007, Divinity independantly releases their first full-length album called “Allegory” and is picked up by Nuclear Blast Records just 3 months after the independant release. Obviously, this was a major turning point for the band! In 2008, Divinity took on it’s first major tour by joining the Summer Slaughter Canada tour. This gave them the opportunity to connect to high-calibre booking agents and other acts such as Dying Fetus, Whitechapel, and Necrophagist. Then in 2009, Divinity spent it’s time creating their 2nd full-length album called “The Singularity” which was released under Candlelight Recordswith a very positive response from numerous reviewers and listeners. Since the release of The Singularity, Divinity has toured Canada numerous times over and has received countless support and praise from around the world. The band is currently in the middle of releasing a trilogy EP concept called ‘The Immortalist’ with Part 1 availabe now at all digital music stores, Part 2 coming out in early February and Part 3 slated for a release later in this year. DIVINITY have decided to release a full-length album in a different way. 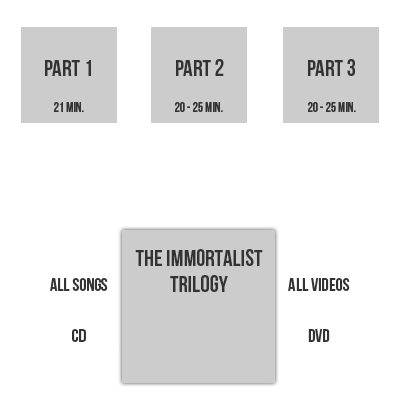 They are going to create a 3 part series of 4-song EPs that will develop a full length concept album that they are calling ‘The Immortalist’. The EPs will be released in digital format only to build up to a physical special edition that will contain all 3 parts in one full length CD along with a full digipak of media such as a video DVD and a full color booklet that illustrates the lyrics and The Immortalist storyline. Each song within the series will develop the storyline of the main character in ‘The Immortalist’ trilogy. DIVINITY will create an online marketing focus on each song for a time period of 6 weeks. This means the Divinity website, Facebook, Twitter, and Youtube pages would only promote and discuss the particular song they are focusing on. They will post videos, graphics, lyrics, song meaning, storyline and as much marketing as possible within the 6 week time period for each song. The overall idea is to have each song they produce for the series to have a focused marketing push on building the storyline of our album concept with a huge build up to the final package that is meant to contain everything to do with the Trilogy along with a few special items to make it worthwhile to own a physical copy. Recently, DIVINITY decided to put their new album into an Indiegogo campaign to build up funding for the entire recording process of the remaining songs. After a 45 day campaign, they ended up getting around $6000 in contributions and they will be using this money to fund the rest of the recording. Part 1 of the trilogy has been released on all major digital music stores since April 22, 2013. Part 2 will be released February 5th, 2016. Part 3 is being written and recorded throughout 2016 and is looking to be completed and released this year as well.